'Junior Conductors Academy: Part One' - The kids are all excited! Why? Because they're off to Junior Conductor's Academy in Laramidia, to try to become Junior Conductors First Class. 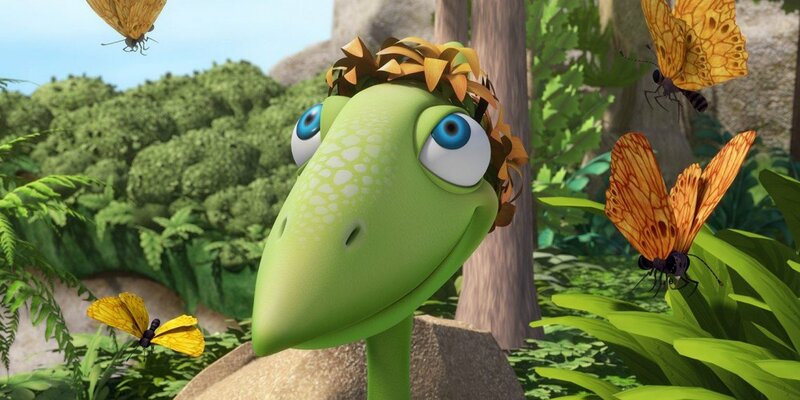 Buddy has a feeling he's going to be a star in class, until he meets Dennis Deinocheirus - a kid who knows even more dinosaur facts than he does! Can Buddy get over his disappointment that he's not the smartest kid in class, and make friends with Dennis (who seems like he's having trouble making friends on his own)? 'Junior Conductors Academy: Part Two' - Now that Buddy and Dennis are friends, they have to work together (with the other kids) in order to pass a series of tests. If they succeed, they'll receive their Junior Conductors First Class pins! But standing in the way of their success is the most challenging instructor of all... Thurston Troodon! Educational Objectives -- Deinocheirus, from the Ornithomimosaur family of theropods in the late cretaceous, had some of the longest arms of any bipedal dinosaur. Also, it's not always easy to make friends with someone you don't understand, but if you take the time and make the effort, it might not be as hard as you think.